buynow/bloglater: Forgive the cheese but...hair we go again! Forgive the cheese but...hair we go again! Look past that achingly faux smile in the photo. I was not pleased with my hair today. You see, this morning I had a brain wave and decided to straighten it. I haven't done that for months and I wanted to see what it looked like/how long it was. And the verdict once complete? It's funny how different it made me feel. Whereas the wavy hair makes me feel confident and pretty, this made me feel depressed and drab. I wanted to give this a mention as I have been wearing it constantly since I got it. This was a perfume exchange with one of my oldest friends in Dubai - old as in I have known him for a long time by the way (we worked together) and not in age. We are both perfume nuts and agreed to exchange for Christmas. This I highly recommend you do with any similar minded friends. There is nothing more special than receiving a perfume from someone who picked it out because it reminded them of you. 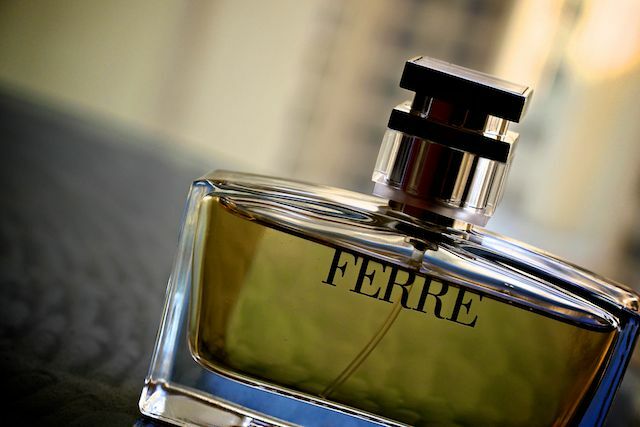 He got Bulgari Black and I got...Ferre eau de parfum by Gianfranco Ferre. This was released a while ago and reminds me of Calvin Klein Beauty in it's notes. Think of soft, misty florals and fruits sitting atop a warm sensual base. It's unassuming and inoffensive. Iris lies at the heart of the notes and for that reason it has been compared favourably with F. Malle's Iris Poudre. If you like that, and you like these soft fragrances that have a hint of powder about them then you will adore this. I got my first GlamBox today. 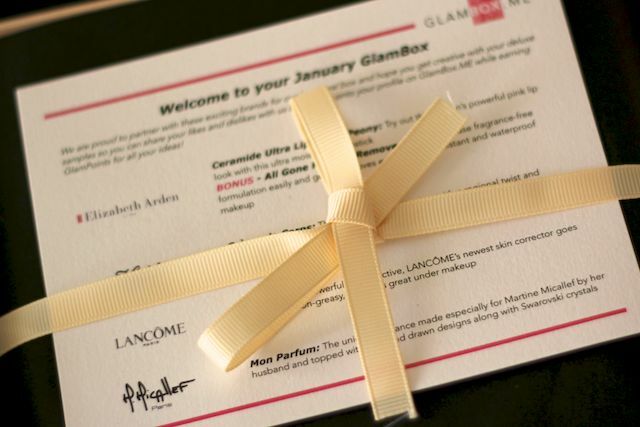 Yes, the beauty box phenomenon has hit the UAE. I will spare you the review right now - I know how exciting and original beauty box review posts are - but this had a couple of nice products in it, including an Arden lipstick I wore in the post above. Hope the week started well for you! Yey, you got the box! I like your hair more curly definitely. Still you look pretty on that first picture though. Also, Ive said it before but you have SO MUCH PERFUME!!! This made me laugh as I am the exact same way with my fringe. I have just spent 8 months growing it out and this week I have been thinking about cutting it back in! That box looks good- I have had a couple (different brand) and it is sort of like Christmas, until you remember that you're paying for it! Your hair looks lovely but I know that mine is so long now that it looks very severe when I straighten it (not to mention it shows up the split ends). I always have to "do something" with it like clip the front up if I straighten it. When it was shorter there was still a bit of volume round the face. I think your hair looks great. We are our worst critics after all..and also where did you get that top? Or is that a dress? Leopard collar on black. Heck yes! What are you in Dubai for? Work, pleasure, family. Boy I'm full of questions today. Lack of sleep. Makes me a little delirious. but i do think you should have a cut done professional that way they can get rid of all the dead ends properly. @Computergirl - i love your comment - although i am not laughing at your misfortune but rather the reference to the Jesus in a face cream :) Will have to check it out! I LOVE getting your posts in my Google Reader. Just found you on FB, now...Yay! Even though, I can't wear much of the fashion, I love your tips, products and accessories suggestions. You keep me on trend! Okay...love the curly hair the best. I love the leopard pan collar too! I might be browsing through my nearest New look on the hunt for that. I like your hair straight but I understand how u feel, whenever i (very rarely) straighten my hair it just looks really flat like it's just been ironed on the ironing board! Isn't it funny how one sligh change to your hair can make you feel do different? When my hair was long I was obsessed with having it curly, and now that it's short, it looks AWFUL (IMO) curly. I need to grow it back out again because I don't feel pretty with it short. @Lisa Dabbs - thank you so much Lisa! @Alyson - you too alyson! Your hair looks lovely straight but I prefer it your usual way, it always looks lovely on you. I never know whether to subscribe to a beauty box or not, I always hear good things about them but guaranteed as soon as I sign up for one it will be full of useless junk. @mldvs - than you :) me too! Laura! You're back in Dubai? That's amazing! Will start checking your blog more regularly now! Yaaaay! A guru in Dubai! Feels wonderful :) I know you've probably been asked this a thousand times, but why no YouTube no more? I do miss you... Come back please? Oh and could you please elaborate on the beauty box thing? Where, how, etc.? Perhaps a helpful link? aww I have a thing for sleek hair, and I think you look beautiful this way! However I have to sport waves this week as my straighteners broke, and I have ordered Cloud Nine ones, have to wait till they arrive! Your hair is so beautiful straight! I love straight and sleek hair! My hair is naturally extremely curly:( The colour brightens your face and it looks SLEEK not flat haha! :)You should give Guerlain My insolence and Cerruti 1881 perfumes a sniff, you will love them! so jealous of your perfume collection...mine is soo bleak! Although you look very pretty in the first pic I do love the curly/waves you usually have...either way still lovely! If it makes you feel any better, here's (me) another person with I want/get/don't want bangs syndrom. I haven't straightened my hair in what seems like years!! reminds me too much of the early 2000's when I used to have poker straight hair and were COMBAT TROUSERS!!! Your hair looks so lovely with a bit of curl...do you normally do much to it or is it naturally like that? The only time my hair looks passable when straight is the day it gets cut. After that, forget it. I love it when you talk about perfume! I bought my first full-size just over the holidays. Well, my bf bought the one I picked out. :) I just feel so overwhelmed when it comes to all that! I suppose it just takes time to really figure out what you like and what the notes really translate to. The video above? It made my Monday!!! i love your straight hair, and i love you wavy hair :) i thought u had highlights at first! deffo love your hair wavy laura, just about to invest in a babyliss pro rebel curling wand...... what size barrel is yours? I have the same problem when I straighten my hair. I have found it less brassy and dry looking if I blow dry first. When I have it done at hairdressers it looks amazing shiny and healthy! Now if only I could have hairdresser at my beck and call. @Ashley - that's so nice and all the more special. what one did you go for? @Melissa- yay! do it! BUT i am not very helpful as I don't know the size off the top of my head...it doesn't say on the side to i may have to do a manual measure and then mention it in another post...hope that's okay! It looks like a fairly chunky one as opposed to the very skinny ones, the one i've found is model no. BAB2281U which im pretty sure is the same or very similar! I just hope I can master it! Would you re-purchase the Redken Thermal Resist? I went for Prada Amber. About 20 minutes after applying it becomes this really nice warm scent...hard for me to describe, but I really like it! I love fringes on people, I think you automatically look artistic, fashion forward and different. I love a fringe on me as well, but it's too much styling with my semi-curly hair! I've tried it four times now, and I've asked my friends to shut me up as soon as I start talking about it again. Haha, I really can't handle that video. Hilarious. I totally know what you mean when it comes to fringes, I was growing mine out for a few months but one day I woke up and felt the urge to cut it. I obvs gave in to this urge. Haha! I think it looks gorgeous straight... but I'm a tad biased... Maybe some layers though, since your hair's got so long. What is the name of the lipstick you are wearing? Definitely your look best with wavy hair but the straight is not bad for a change. The whole bangs thing was so funny! I can totally relate. I ALWAYS get bangs in hopes of adding *something* (don't know what that something I'm looking for is though) to my look. It always sort of fails and I end up hating it a week later. I did the same yesterday and hated it, flat lank locks draped around my face all day, yuk! I also cut in a fringe in a time of crises then weep for a week. I feel the exact same way about straightening my hair. I think mine is quite similar in style to yours and my friends never understood why I never used my flat iron - it's hasn't been turned on in years and whenever I feel like I might welcome the change I refer to an old pic that I hate with the lifeless locks haha! Your hair looks lovely, that leopard print collar is really cute! I'm surprised beauty boxes are only starting to take off in UAE, I thought they would have already been thriving and have amazing products! My hair is similar to yours, and I used to straighten it aaaall the the time, until I realized it looked much better when I embraced my natural texture! Laura hello - love reading your posts, thank you for that. Wanted to know which glam box you use? The one I can find via google is this: http://www.glamboxcosmetics.com - not sure if this is what I want. I think your hair looks lovely straight and I also love the straight part down the middle.